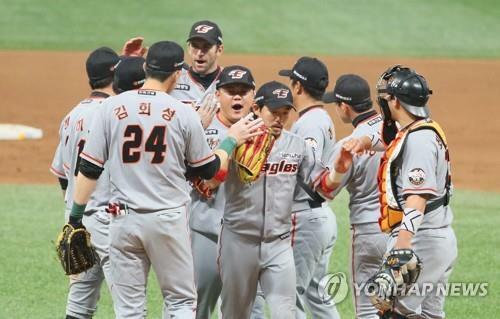 SEOUL, Oct. 22 (Yonhap) — The Hanwha Eagles defeated the Nexen Heroes 4-3 to stay alive in the Korea Baseball Organization (KBO) postseason on Monday. 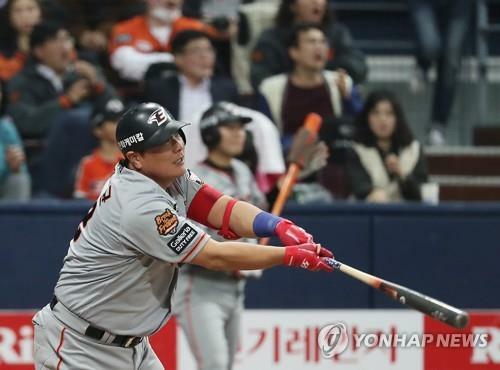 Veteran designated hitter Kim Tae-kyun knocked in the go-ahead run with a double in the top of the ninth inning, as the Eagles prevailed by the narrowest of margins in Game 3 of the first-round series at Gocheok Sky Dome in Seoul. The Eagles had dropped the first two games of the best-of-five series at home last week, and blew a couple of leads in this one before Kim put them ahead for good with his RBI two-bagger. This was the Eagles’ first postseason victory since Game 3 of the first round on Oct. 12, 2007. Game 4 is back inside the dome at 6:30 p.m. Tuesday. The Eagles bounced back after hitting into a triple play — only the third in postseason history — in the second inning. The Eagles scored first for the second straight game but also found themselves at the wrong end of postseason history. Following a leadoff walk in the top of the second inning, the Eagles touched Nexen starter Jake Brigham for three straight singles, the last two by Ha Ju-suk and Choi Jae-hoon driving in a run each for a 2-0 lead. With the men at first and second, No. 8 hitter Kim Hea-sung failed to put down a sacrifice bunt. Then on a 2-2 count, Kim hit a chopper down the third base line, and third baseman Kim Min-sung started the rare triple play. Kim fielded the ball and stepped on the bag almost in one motion, and threw to second for the force out. Second baseman Song Sung-mun then fired a strike to first baseman Park Byung-ho to complete the rare feat. Brigham, who dodged a bullet, settled down to retire the next six batters in order, and worked around a leadoff double in the fifth to keep the Eagles off the board. With their starter keeping them in the game, the Heroes knotted the score in the two-run fifth. Hanwha starter Jang Min-jae held the Heroes to just two singles in the first four innings but visibly tired in the fifth. Kim Kyu-min drew a leadoff walk and advanced to second on a sacrifice bunt. Seo Geon-chang then brought him home with a line drive double to right-center field. That hit chased Jang from the game. Left-hander Im Jun-seob got one out, and handed the reins over to right-hander Lee Tae-yang to face right-handed slugger Jerry Sands. Sands worked the count to full and knocked a single to left to make it a 2-2 game. 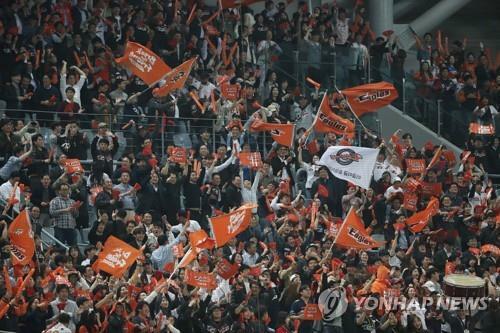 In the top sixth, Hanwha slugger Jared Hoying broke the tie with one swing of the bat. On an 0-2 count, Hoying turned on a high fastball from Brigham and sent it well over the right field wall for a solo home run, putting the Eagles up 3-2. It was the first home run this postseason by both Hoying and the Eagles. The Heroes tied the score again in the bottom half without producing a base hit. With one out and a runner at first, Lee Tae-yang induced a comebacker off the bat of Kim Min-sung. But trying to turn an inning-ending double play, Lee made a wild, off-balance throw that sailed into center field, putting runners at the corners. New pitcher Kim Beom-su struck out his first batter, but then threw a wild pitch to let in the tying run. The Heroes threatened in the bottom eighth with two men aboard and one out when the Eagles summoned their closer Jung Woo-ram. The left-hander promptly got an inning-ending 3-6 double play, and it set the stage for Kim Tae-kyun’s ninth inning heroics. Hoying led off the inning with a single but was erased at second when Lee Sung-yul hit a grounder to third. With the right-handed batting Kim at the plate, the Heroes pulled lefty Oh Ju-won for right-hander Lee Bo-geun, making his third straight appearance of the series. Kim wasted no time, as he lined the first-pitch fastball into the gap in right-center, and Lee, never known for speed, chugged all the way home for the go-ahead run. Jung Woo-ram stayed in the game and worked around a one-out single to finish off the game and earn the victory. For the second straight game, starters didn’t pick up a decision. Jake Brigham pitched seven innings for the Heroes, the longest any starter has thrown in the series, and allowed three runs on six hits, including Hoying’s solo shot. Soft-tossing Jang Min-je was nearly unhittable in the early going, painting the corners and changing speeds to keep hitters off balance in the first four innings. The right-hander ran out of gas in the fifth and was charged with two runs in 4 1/3 innings on three hits and two walks. Winning manager Han Yong-duk said he saw plenty of encouraging signs from the victory. This is Han’s first season as the manager, and the Eagles are in their first postseason since 2007. Han said he and his team are learning on the fly. Both clubs will start rookie left-handers in Tuesday’s Game 4. The Eagles will look to extend the series with Park Ju-hong on the mound. He made six regular season appearances against the Heroes and had a 10.29 ERA. He was an underwhelming 1-1 with an 8.68 ERA overall. Park could be used as an “opener” before the Eagles turn to other relievers in the second or third inning. The Heroes will try to finish the series by sending Lee Seung-ho to the hill. He had a 1-3 record and a 5.40 ERA in the regular season, and had an 8.10 ERA in three appearances versus the Eagles without a win-loss mark. Lee, too, could be asked to eat up the first couple of innings before the bullpen gets to work.